Can I share the onesie topiary I made my best friend? I still have to put the moss on the pot, but I love it, I think it's one of the best I've made so far So excited to give it to her Saturday! Re: Can I share the onesie topiary I made my best friend? Thats awesome!! Do you mind sharing or FMing me with directions?? Wow, Rachel! That is amazing!!! Where did you learn how to do that??!! omg thats awesome!!! can you post the directions? That is amazing! You are so talented! awesome!!! love the moses basket too!! where's that from? Thanks! I'm so glad you girls like it My sister made one for my shower when I had Ava and now I like to make them for all my good friends when they have babies. I don't mind sharing the directions at all! For this one, I used 40 (I'm an idiot, I originally said 64, there's something wrong with my math abilities these days!) onesies of various sizes, 12 wascloths, 6 pairs of socks, ten bibs and three burp cloths. Then I filled any gaps with some silk flowers I had on hand. First, put the styrofoam in the pot, then run the dowel down the center. Put some hot glue on the top of the dowel, then insert into the styrofoam ball. Proceed to stick the lollipop sticks all around the ball, inserting with hot glue on the end to keep them in place. Place them about two inches apart, but in random order. Once that's done, roll up your baby items tight, fold in half and rubber band at the fold nice and tight. Then, slip them around the lollipop sticks, arranging them to fill up the spaces. I use the biggest pieces of clothing first, then fill smaller spots with the smaller items. I work my way down in size until I'm sticking the socks in here and there to fill in. 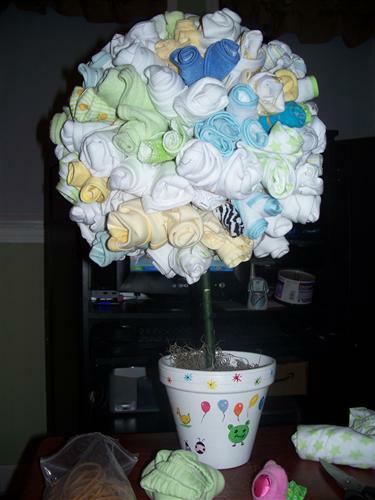 I usually am able to fill the whole thing with just baby items, but I really didn't need much filler when I was done with this one and happened to have leftover flowers on hand, so I filled spots with that instead. 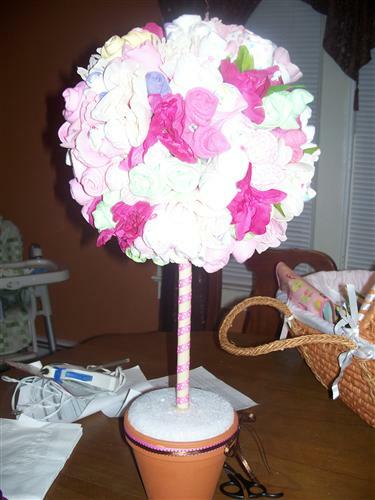 I think I used ten silk flowers in total. Then I wrapped the dowel with ribbon and I have to put the moss on. It's actually all really easy from start to finish! Message edited 2/10/2010 9:30:36 AM. 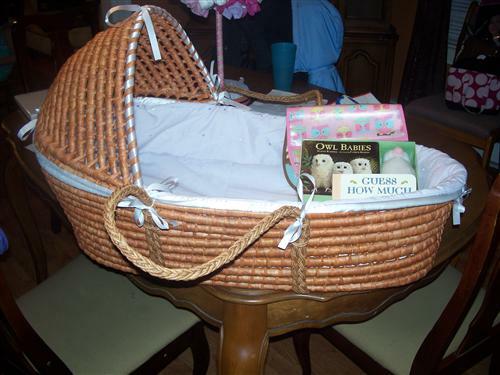 I'm so in love with the moses basket, too! It's from overstock, believe it or not! Wow this is so cool! 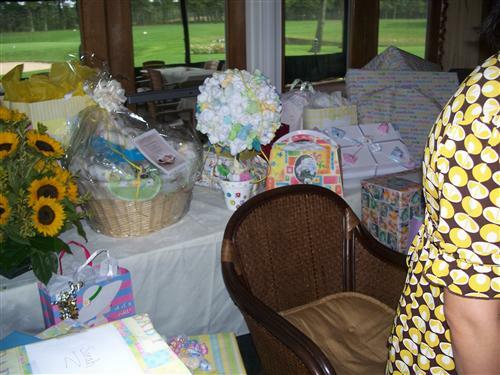 I would have loved to have received that at my shower Very pretty! Amazing job!! What a lucky BF you have!!! Gorgeous! You are so talented Rach! Wow...that is awsome! My friend is due in august which should give me plenty of time to practice! Curious though....how big of a styrofoam ball do you use? You should do that for a business! They look awesome. That's awesome! 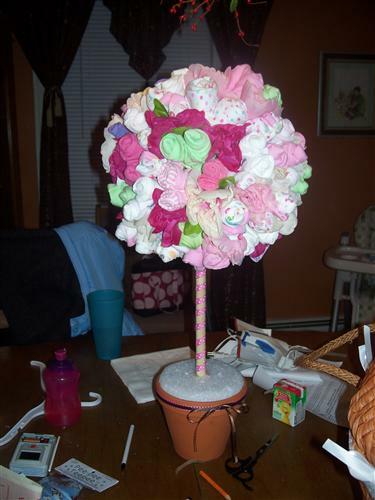 I totally want to make one for my friend's shower next month!